The Times should get credit for aggressively covering some issue. In this case, unfortunately, it is a charade in which we learn almost nothing that will actually help us get our lives and our country under control. The choices that media outfits make about what to cover, and when, and how to play it, make all the difference in the success or failure of candidates. Because the public only knows what it is told—and it gets most of its info filtered by self-serving ads or by news organizations. 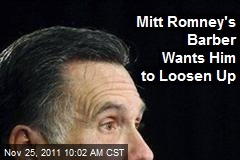 Thus, Romney will sink or swim based on whether people like and trust him. The cumulative theme of these articles seems to be that you should feel a-A-OK about this guy. That some are jocular and light-hearted in spots does not diminish the messages they send. Consider the frugality-themed article. Every good article has some theme, overt or otherwise. In this case, the subtext seems to be: Romney may have huge sums and represent Wall Street excesses, but forget about that because he doesn’t actually spend what he makes. He’s a cheapo extraordinaire, in a kind of folksy way, for example driving a banged-up old car when his employee drives a Porsche. Missing is this crucial context: many of the One Percent are not big spenders on themselves or their families. They use their funds sparingly, and largely to maintain their power (by funneling money to lobbyists, candidates, lawyers, security people and so on)—then passing the bulk of their estate along to their descendants to maintain familial hegemony. It is this, not reckless spending, which characterizes how they dominate the rest of us. The Old Money typically mocks the “nouveau riche,” yet it is often the nouveau riche and their calculated openness to risk that creates opportunities for the 99 Percent. Besides, does Romney’s extreme penny-pinching tell us that he will cut back on the “welfare for the rich” which characterizes so much of government policy today—or slash those big expense categories like military contracts? Don’t bet on it. The piece on Mrs. Romney perpetuates the myth that First Ladies actually matter in a substantive way. In fact, they set a certain tone, in the way all celebrities do. But we shouldn’t be voting for likable First Ladies, and news organizations shouldn’t be encouraging us to do so. And while it is nice that Romney has stood by his wife through her multiple sclerosis while Newt would abandon his mates for almost any reason at all, marital fidelity is not necessarily the mark of a good president. The article in which Romney tells the Times that Gingrich is too “zany” is a barely coded signal that Gingrich is not really controllable, while Romney knows his place. Gingrich, it seems, is not controllable by anyone—including the powerful and rich interests whose bidding he often (but not always) does. The subtext of all these articles seems to be: Romney is worth saving so that the choice in 2012 can be between two candidates who will accept the status quo, and not make waves for Wall Street, the military contractors and the One Percent, or derail the consumer machine that funds most of journalism, while preserving public order and good taste, which the corporate media always feel is a top priority. Our national history bears the comforting lesson that the American people’s confidence in the rule of law and the stability of their institutions will not be damaged in the long run. It is incumbent on citizens and elected officials alike to respect the authority of the ruling and the legitimacy of the new presidency whether or not they agree with the court’s legal reasoning. In the short term, Mr. Bush and Vice President Al Gore bear great responsibility for bringing the nation together in spirit if not in immediate political agreement. Mr. Bush needs to be gracious and unifying in victory, and Vice President Gore must master the difficult task of placing the national need for continuity ahead of any bitterness he may feel. To be sure, it’s better to get some reporting than none. And outfits like The Times do come up with substantive, useful material now and again in their election coverage. But what’s missing in this recent flurry of campaign 2012 “reports” is any deeper sense of what makes Mitt Romney tick. Why, truly, does he want to be president other than the fact that he has the resources to run and—well, what else is left to shoot for once you have everything? And, most important, why should we believe that he cares about all Americans and will take some necessary risks to create beneficial change for us all?